I don’t know why I’m so surprised when I meet young people who have no interest in voting. After all, I didn’t vote the first few times I could have. Watching the Vietnam War and the Civil Rights Movement play out on the nightly news inspired my youthful interest in politics. But by the time I graduated from high school the war was winding down, it seemed as if Dr. King’s dream might come true, and Nixon was letting the door hit him on the way out. I thought that the world would get along just fine without my participating in its affairs. Politics faded into the background as my interests gravitated towards spirituality and music instead. As I became more and more focused on my spiritual life I became less and less focused on “material life”… including politics. I was blissfully unaware of the fact that my indifference was a privilege: as a straight white man living in New York City I wasn’t subjected to the kinds of injustices that motivated others to be politically active. In my spiritual immaturity, I also failed to realize that my primary source of spiritual inspiration, the Bhagavad-gita, was a book about how a yogi should respond to the most extreme kind of political problem: armed conflict. The response the Gita advocated wasn’t to walk off the battlefield and go do yoga in the forest; it was to step up to the call of duty and fight the good fight. According to the Bhagavad-gita, there’s no contradiction between cultivating an inner life of personal spiritual development and an outer life of active social engagement as long as that engagement is dedicated toward “the welfare of all living beings. From the standpoint of yoga, the ultimate welfare work is to give the gift of transcendental knowledge. Forgetfulness of our shared spiritual nature is the root cause of all suffering. Therefore, the objective of spiritual activism is to create a social setting that’s conducive to everyone’s spiritual upliftment. The Gita’s criteria for spiritual activism are principles of universal morality collectively known as dharma. 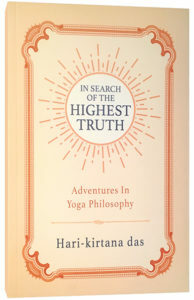 In the Vedic yoga tradition, dharma is composed of four values: austerity, purity, mercy, and truthfulness. Austerity means to simplify our lives by letting go of the desire to acquire wealth and possessions beyond what we need to be comfortable. Purity means to maintain cleanliness of one’s body and mind, to refrain from polluting the environment, and to be honest and virtuous in our relationships. Mercy means to be kind, generous, and compassionate to everyone, to both refrain from harming others and to give protection to those in harm’s way. Truthfulness means to acknowledge and abide by objective reality, to speak truthfully and to act in accordance with the truth. A society that is obsessed with economic development, that fetishizes material wealth, that disregards environmental protection, that glorifies mean-spirited selfishness, and treats the truth as an enemy, is a society moving in opposition to dharma. Politicians who move society in opposition to dharma invite the opposition of yogis who are committed to defending dharma. For a yogi, defending dharma is an integral part of a complete yoga practice. And in America, one of the easiest things that we can do in defense of dharma is to vote. You may not be excited about any of the candidates on the ballot. You may believe that none of them exemplify dharmic values. You may be right. You may think that it doesn’t matter which candidate wins because your life won’t change either way. You may be content to let politics fade into the background because you’re not subjected to the kinds of injustices that motivate others to be politically active. You may think that the world will get along fine without your participating in its affairs. And perhaps it will get along fine without my participation. If I vote or if I don’t, it won’t change anything for me. I could sit out this election on the plea of enlightened disinterest and go off to the forest to meditate. But voting is not just about me. And it’s more than just a civic duty: voting is a service. And service is an integral part of our eternal nature: everything we do is a service to someone or something. There is no question of serving or not serving, only of how we serve. On Election Day, A yogi serves by defending dharma, by taking a stand for simplicity, virtue, generosity, and truthfulness. Our local polling station is the battlefield and a ballot is our weapon. On Election Day, yogis are called upon to fight for the welfare of all living beings. On Election Day, yogis vote.